Chimaek (Korean: 치맥) is a compound word formed from Chicken and Maekju, the Korean word for "beer". 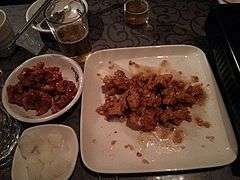 It refers to a combination of chicken (usually fried or spicy) as Anju and beer served around evening in many South Korean restaurants, including a number of specialized chains. From the roasted chicken that appeared in early 1960s to the spicy chicken that was adapted to meet Korean tastes, Korea has imported and developed a growing variety of chicken dishes. At the same time chicken was becoming more popular, a draft beer that appeared in the 1970s also became very popular, and eventually it became common for the two to be combined as a single menu item. Moreover, the 2002 Korea–Japan World Cup triggered the sensation of Chimaek. Chimaek has had a significant impact on Korean drinking culture. Chimaek is also popular in China because of the influence of the drama My Love From the Star, in which Cheon Song-i, the heroine, said "A snowy day is just perfect for our Chimaek time ..."; this was the trigger for this phenomenon. Specialty chicken shops have been more numerous in China. Uploading pictures of oneself holding a chicken in one hand and a beer in the other on social networks became a trend. Nowadays, Korea is trying to be reborn as a capital of Chimaek. Chimaek holds a special place between the public and the consumer. In Daegu Metropolitan City, a Chimaek festival was held in 2012. In 2013, a Chimaek festival in Ningbo drew some 400,000 visitors in its first three days. Chimaek is a profitable franchise. Demand for specialty chicken shops increased with the growing demands for chicken and beer. As of March 2014 Korea had 192 chicken franchise companies. About 10% of companies are known for unique recipes. ↑ "Seoul Night Tour Gangnam (Cheongdam)". Korea Tourism Organization. 27 June 2014. Retrieved 4 November 2014. 1 2 3 "Korean TV Show Sparks Chicken and Beer Craze in China". Wall Street Journal. ↑ "[도청도설] 치맥" [Chi-Mc]. Kookje. 9 March 2014. Retrieved 24 November 2014. 1 2 Seo Jung (서정), Kang (강). "중국 치맥 열풍..'별그대' 전지현 대사 한마디 때문에" [China is in the storm of Chimaek]. Chosun Media. Retrieved 2 March 2014. 1 2 3 4 5 Woo Seok, Lee (7 August 2014). "[SS먼데이 이슈추적]치킨은 어떻게 치느님이 되었나. 치맥 문화와 산업" [Culture and Industry of Chi-Mc]. Sports Seoul. Retrieved 24 November 2014.